I couldn’t have asked for better, Katie was very understanding of my sometimes changeable requests and the endless questions I asked. The service provided was excellent. When I turned up at the reception on my wedding day I was blown away by all the little extra finishing touches Katie had put in since we’d left the venue after setting up the day before. From what we discussed to what she delivered was over and above what I was expecting!More importantly on set up day she was like part of the family, so lovely, even letting my 94yr old Grandad give her a hand when I’m sure it was the last thing she needed! “Thank you so much for your help with our wedding day decorations! Not only did you do an incredible job (and understood our theme completely) but you took away a tremendous amount of stress for our big day. We were able to relax and enjoy the evening before and the morning. Katie, where do I even begin!? Thank you SO much for absolutely everything you did for us on our big day! Everything felt so easy with you at the helm! You’d styled our big day to absolute perfection and we cannot thank you enough! We will be sure to tell absolutely everyone who was responsible for making our dream venue look absolutely perfect! Everyone has commented on how wonderfully personal our day was including the decor and that was all done to you so thank you! All our love Mr and Mrs Bladen-Blake! Where to begin with the wonder that is Katie??? She was recommended to me by a friend to dress our wedding. From the moment we spoke and started exchanging ideas I knew she was the woman for me. She took our ideas and made them into something exceptional and personal with her creative flare and brilliant creativity. You took care of absolutely everything (including me on the day itself!!!) nothing was too much trouble and you made the place look perfect. I can’t recommend you highly enough, it was perfect from start to finish and I feel sad I don’t get to work with you again. You’re a dream to work with. The vintage house that could is perfection and the best woman to work with to create a perfect wedding. Finding Katie for our wedding reception was the best thing that could happen. I always had an idea of what I wanted but I had no ideas about the execution. It was all thanks to Katie’s patience and the most incredible creativity that made the entire venue come to life. All of our guests complimented the styling on the day and we couldn’t have been happier with the way it looked. Honestly from the bottom of my big heart thank you thank you thank you! I could not have asked for anything more perfect. You have to book these guys for any event, Katie has got a seriously amazing eye for the big things the small things and everything in between. Both her and her daughter made our venue look absolutely beautiful, she managed somehow to take my muddled up vision and piece it all together and just wow. They are so chilled out and were really patient with me and held of as long as possible as we awaited the weather to see if we were or weren’t able to have our ceremony outside. Thankfully we managed that! One of the main reasons our wedding was so incredibly perfect (apart from the actual marriage 😉) was down to how beautiful it looked. Katie took our ideas, turned them into a concept, and made it a reality. She has an excellent understanding of the people she works with and this makes her styling so unique to you -it made our day completely unique to us too. The time, effort and care were shown in every small detail and what I loved so much was that it was kept as a surprise to me. I think what I love most though is that people are still talking about the great vibe and it’s all of the extra touches that helped make the atmosphere so relaxed and fun. Getting married in a woodland was a dream and Katie made it possible . Katie at The Vintage House That Could beautifully styled our wedding at The West Mill back in February. We had various meetings beforehand whereby she offered advice with such an artistic flair that we trusted her to make our venue perfect. She was amazing from start to finish and came up with ideas that we would never have thought about. She is very friendly, organised and innovative and we’re so glad she was able to make our wedding just what we wanted and more. We kept noticing props, flowers and finishing touches on the day that made it extra special and Katie really knows how to make a venue look sensational and we’re glad we have photos so we can relive Katie’s creative input for years to come. Katie is brilliant at what she does and as well as this she is a fantastic teacher, friend and an inspiration to us all. My wife and I would fully recommend, thank you so much! Katie was absolutely fantastic both before and on the day. She completely got our vision even when we couldn’t articulate it ourselves. She had so many beautiful, creative ideas and our venue looked stunning. We were so overwhelmed with the attention to detail. Katie went to so much effort, to make our venue look perfect including meeting us at the venue before to discuss our plans. Our hanging flower chain across the ceiling of the marquee was stunning and everyone was amazed. We met Katie through our stationer and we are so glad that we did. Before we met Katie we hadn’t really considered getting a venue stylist as we thought the florist would be enough but we are so glad that we met Katie! Katie was worth every single penny and we can’t thank her enough for helping us to make our day so special. We’d recommend katie to everyone. Katie was amazing from start to finish. So accommodating and so brilliant-her artistic talent knows no bounds, which I knew already, but to see our dream day come to life with her creativity was incredible. So many guests commented on how all the little touches were so perfect for us-that’s because Katie listened to what we wanted and what we liked and then ran with it beyond our wildest dreams! ‘The most instagrammable wedding ever’ is what some of our guests said, and I couldn’t agree more. Thank you thank you thank you!!! I met Katie at a Wedding Fayre in Burton and I am so glad that I did! I cannot even put into words how amazing this woman is!!!! From our initial discussion I knew that I could trust Katie to style our wedding and actually she did better then I ever thought possible. Walking into our venue the day before and seeing Katie hard at work actually reduced me to tears (good tears!). The amount of effort she was putting into transforming the venue you would be forgiven for thinking that she was the bride! On the wedding day itself Katie went above and beyond by helping the men with their button holes and me with my dress, it’s touches like this that show passion. Everyone commented on how stunning our venue was and the level of detail displayed and I’m honest when I tell that if it wasn’t for Katie it wouldn’t have happened. Katie styled our Italian themed wedding last week (3/8/17) and it couldn’t have been more perfect. We loved it, the guests loved it and so did the venue. Everything went without a hitch and we had nothing to worry about once we’d set our initial ideas in place with Katie. I would recommend Katie for any wedding or event – she will listen, but also knows which ideas will work best with your theme. Absolutely Amazing, Thank You Katie! Katie decorated our wedding and we could not be more happy. Great person to work with and the results were stunning even when working towards a tight budget. Cannot recommend enough. I don’t even know where to start with thanking Katie for all of the hard work and enthusiasm she put into styling our wedding. The only phrase I can think of is ‘above and beyond’. She was so creative and made it exactly how we wanted it to be and more. We had so many compliments about how fantastic everything looked. Everything from the intial consultation to the day itself ran so smoothly and stress free. Katie kept in touch at every step and involved both of us in all decisions. We met Katie at the Vintage Wedding Fayre at Leamington Spa. We really liked her vintage display and table decorations and decided to book her there and then. Katie’s experience proved invaluable throughout – She listened to our ideas, provided suggestions and even visited the venue with us. When we arrived at the venue on the evening of the wedding, Katie and her helpers had just finished setting up and we were so so happy with the end result, the room looked stunning and we loved all the little touches, it really brought the vintage theme together. Many of our guests commented on how great the room looked and how they loved the decorations. 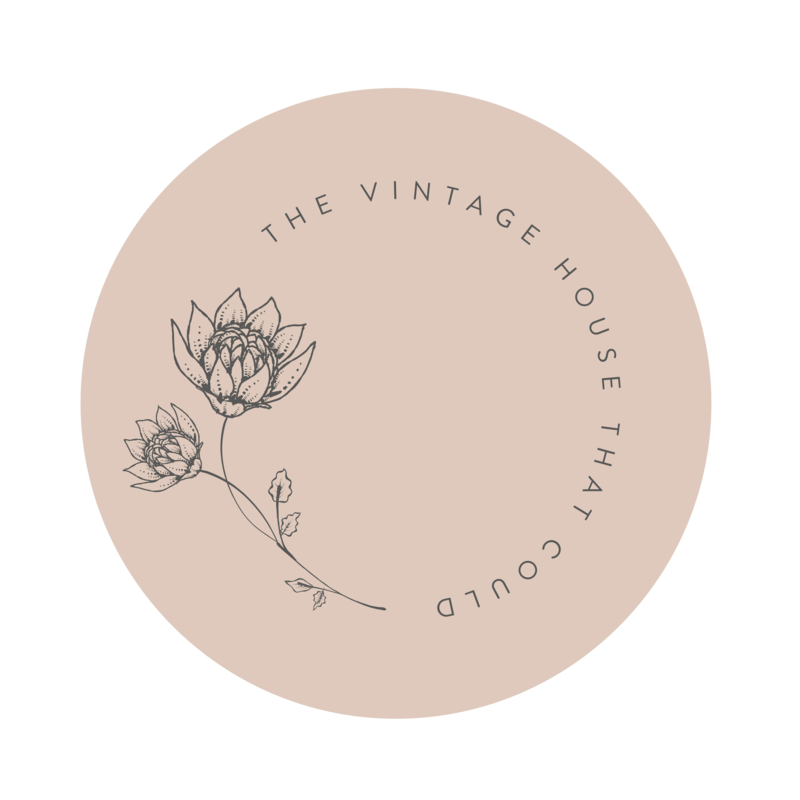 We would definitely recommend The Vintage House That Could to anyone considering a vintage theme for their party or wedding – Katie is professional, accommodating and brilliant at what she does!